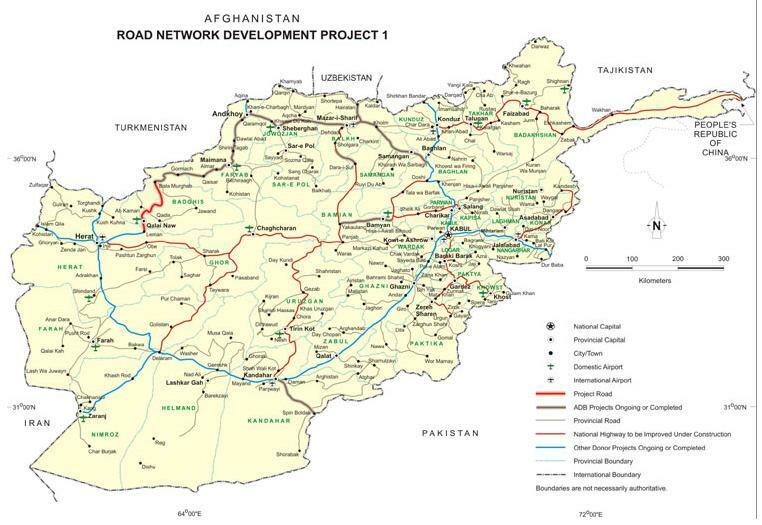 Afghanistan’s ring road, courtesy of the Asian Development Bank. Roads, logistics and transit have long been a focus of The Captain’s Journal. Naturally, we’re interested to see the beginnings of one key element in the U.S. strategy, reclaiming the ring road. Rocket-propelled grenades streaked through the fading light and exploded behind the US convoy patrolling in eastern Afghanistan. Muzzle flashes flared in the gloom as Taleban insurgents opened up with heavy machineguns and AK47s. Delta company was caught in an ambush. Foul-mouthed soldiers swung their weapons towards a complex of mud-walled buildings 800 yards away. “Get some!” roared the gunner of an M19 grenade launcher. The thud of return fire from the Americans’ vehicle-mounted weapons began. Soldiers inside their Humvees opened bullet-proof windows and slid their rifles through. Those on the right side of the convoy scrambled out and brought their weapons to bear on the sparks flashing in the distance. Red tracer flew towards the buildings. The slew of hot shell casings from the gunners’ turrets that had cascaded into the vehicles began to ease. A foot patrol cut around the insurgents’ flank as darkness fell, running hard through wheatfields, ducking every 50 yards. No one spoke. Everyone sucked in air. Afghan National Police went with them as they pushed through the mud compounds. Breaking down doors by torchlight they found terrified women and children inside who said that they knew nothing. Some shielded their dignity by facing walls. The only man there of fighting age was blind. Part of the first ripple in the US troop surge to Afghanistan, Delta company and its sister units are securing a 67-mile stretch of the Kabul to Kandahar highway, the country’s main north-south road. 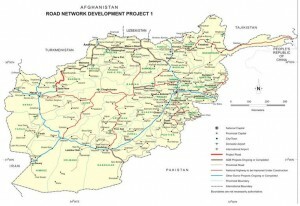 Sixty per cent of Afghanistan’s population live within 30 miles (50km) of one of the country’s main highways, collectively known as the “ring road”. “The single biggest measure the Afghan people have in their mind of whether or not there is security is their ability to travel with freedom,” Lieutenant-General Jim Dutton, Nato’s deputy commander in Afghanistan, told The Times. Reclaiming the ring road is a key plank of US and Nato strategy. We have long recommended the securing of that bad stretch of what is otherwise called Highway 1, especially from Kandahar to Kabul. Logistics is a nightmare on this road, and many hired Afghanistan drivers have perished at the hands of the Taliban. It was the very astute Philip Smucker who said “If Afghanistan is to ever be secure, it must first be paved.” We linked his interview in Backwards Counterinsurgency in Afghanistan, and if you haven’t listened, you have another chance to hear this important conversation. While we have strongly recommended reclaiming the ring road for purposes of logistics, security and development, it is important to remember what “reclaiming” the road means. It doesn’t mean building it or paving it, although that is certainly included. It also means kinetic operations by infantry to find and kill the enemy. If the Taliban are left alive and the roads are constructed, it only provides the Taliban with a means to rapidly travel from one place to another to collect their taxes and enforce their government. Roads are inanimate objects, and alone they cannot compete with killers such as the Taliban. Roads are at best one tool, and for this reason, The Captain’s Journal has recommended that more troops be sent to Afghanistan. TCJ concurs with Philip concerning roads. TCJ also claims that until there is no safe haven for the Taliban, until his sanctuary has been turned against him, until the terrain in which he raises his largesse and recruits his fighters has become his death trap, Afghanistan will not be secure. 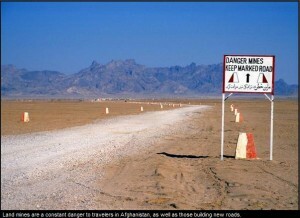 Mines and IEDs are a constant threat, but paving the roads means an immediate reduction in IEDs. Digging in pavement is harder than digging in dirt. The Taliban would simply melt away, wait for the Pakistan Army to leave, and then re-enter the area and kill anyone who cooperated with the Army. Or if they stand and fight, the history of the Pakistan Army indicates that they will simply pull back and sign a new peace deal. As a matter of fact, the Tehrik-i-Taliban have slipped away. The Pakistani military warned today that the house-to-house combat its troops are fighting in the Swat Valley’s capital would not be a decisive battle against the Taliban insurgency in the area, saying militants had slipped out of the city to fight another day. The army has secured more than 50 percent of Mingora, Maj. Gen. Athar Abbas, the military’s chief spokesman, told ABC News, but he said fighters are “withdrawing from the city.” “The fighting is not as stiff as it could be. It appears that the last ditch battle will not be there,” Abbas said. Pakistani officials say the fighting in Swat and across three districts in the volatile northwest is for Pakistan’s very “existence.” The military has failed to finish this same battle twice before, and there is a widespread sense that if it fails again, and if the administration fails to fill the governance vacuums that helped the Taliban spread, they will never again enjoy the level of popular support that this operation has. But that support will be tested in the next few weeks and months as more than 2 million internally displaced Pakistanis from the northwest begin to get anxious to return to their homes, aid workers say. The fighting has created the largest population exodus since Rwanda in 1994, and with the vast majority of the displaced living in friends’ or families’ homes, aid workers warn that their patience will begin to fade. Many of them are already losing their only source of income: crops, which are supposed to be harvested this month and are rotting as the fighting prevents many people from returning to their farms. “People are really getting frustrated. The support they’re getting is not what they should be getting,” says Amjad Jamal, who works with the World Food Program in Islamabad. Another aid worker, who declined to be identified, said too much of the relief was going to camps and not enough was going to homes where the displaced are often straining already cramped quarters and pinched pocketbooks. So if the Pakistan Army never intended to stay and conduct stability operations and provide security from the Taliban for the population in Swat, based on the ill feelings from the rotting of the crops, the displacement of two million residents, and loss of income, it would have been better had the operation never been conducted. But if the Pakistan Army can snap out of its neurotic preoccupation with India to see the real threat and stay to conduct counterinsurgency in Swat, something may still be gained out of this campaign after all. Time will tell, but the answer will depend upon the will of the Army and administration to do what needs to be done. There are seasons in any campaign, in any counterinsurgency effort. The Army Chief of Staff may have claimed that U.S. forces could be in Iraq for ten more years, but they will mainly serve to ensure that Iraq is a protectorate of the U.S. American troops will not be performing classical constabulary operations. In a sign of the nature of the current phase of the campaign, the last Marine artillery is headed home. CAMP AL TAQADDUM, Iraq – As the security situation in the Al Anbar province continues to improve, the final Marine Corps artillery unit to operate its cannons in Iraq, Battery G, 2nd Battalion, 10th Marines, Regimental Combat Team 6, is preparing to go home, signifying a significant change in the nature of the conflict in Anbar. Three Marine artillerymen currently deployed with RCT-6 were present during the initial push into Iraq in 2003, and these same men returned with a new mission – to see the conclusion of artillery’s chronicle in Anbar province. On Monday, May 25, a roadside bomb blast killed three people in demonstration of the fact that Iraq has failed at the present to adequately address the issue of the Sons of Iraq. A roadside bomb killed three Americans traveling in Falluja on Monday, including a State Department official working at the United States Embassy in Baghdad, American officials said Tuesday. The State Department official, Terrence Barnich, was deputy director of the Iraq Transition Assistance Office in Baghdad. A resident of Chicago, he was hired for the job in January 2007, according to State Department officials. The attack also killed an American soldier and a civilian working for the Defense Department. Their names were being withheld pending notification of relatives. Two civilians working for the Defense Department were wounded, the officials said. The attack took place within a few miles of the bridge where four American contractors were killed in March 2004, their bodies burned and mutilated, and dragged through the streets. The jarring images of that attack were a major factor in the American military’s decision to begin its first major offensive in Falluja, a center of the Sunni insurgency, months later. The insurgency is fundamentally defeated, but not completely absent. But the Status of Forces Agreement (SOFA) has ensured that the U.S. forces don’t have the freedom, latitude or authority that was once theirs. Each security incident brings with it the threat that Iraq will demand that U.S. Soldiers be tried in Iraqi courts for crimes against Iraqi citizens. U.S. Soldiers and Marines will soon be out of cities altogether under the SOFA. There are troubling signs, including the fact that there appears to be a stark failure to honor agreements made to the Sons of Iraq. In the South, the Basra police are simply dreadful. In March 2008, about the same time the 793rd arrived in Baghdad, the Iraqi army swept through Basra and cleaned out the Shiite-backed militias who waged much of the violence in the area. During the campaign, some Basra police either joined the militias or abandoned their posts, according to Marine 1st Lt. Mike Masters, the intelligence officer for an Iraqi army training unit inside Basra. But there are also encouraging signs. The newly elected Speaker of Parliament is shaping that institution into one that might be able to hold the Maliki administration accountable for its ineptitude. There will be both encouraging and discouraging reports coming from Iraq for a long time to come. But given the basic framework for U.S. involvement and the phase of the campaign, the Iraqis have an opportunity at a functional society. Any future violence is in their hands and on their collective conscience. It belongs to them now. The incomparable Philip Smucker has given us a very stark look at the latest counterinsurgency struggle at a far flung outpost in Afghanistan. The Taliban took shelter in the U.S.-built school they blew up last year before they began the 400-foot climb, rockets in hand, to the American bastion on the hill. Fortress Margha, with its grenade launchers and mortars sticking out from behind sandbags and bulletproof windows on three watchtowers, is a safe redoubt for the American troops stationed there. Within its walls, soldiers play ice hockey and video games that imitate guerrilla warfare. For the Afghans who live in a medieval world of mud homes with interlocking walls in the valley below, however, reality is a reign of terror. Taliban fighters rule the day and the night in the Bermel district, using threats and atrocities to control the civilian population, Afghans in the valley told a visiting reporter in interviews over two weeks. Accompanied by Arab and Chechen advisers, they behead civilians or sever their hands to force their cooperation. One of the latest Taliban edicts is a ban on cutting trees, so that insurgents can hide and lay ambushes for foreign troops. The small U.S. base can be defended against as many as a thousand insurgents at once, confident American soldiers said. That sums up their dilemma, however: The fortress protects American troops, but it does little to help win a guerrilla war that’s now in its eighth year and about to enter another violent summer. The faltering U.S. and NATO efforts in eastern Afghanistan have in effect surrendered the countryside – village after village – to insurgent bands, many of them criminal gangs but some of them with weaponry and the backing of al-Qaida. An older man, leaning against a mud wall, sighed … “People want protection, but they have none,” he said. Jones said that in a half-dozen attacks on his “route clearance” convoy – manned mostly by National Guardsmen from Virginia and California – insurgents had destroyed several hundred thousand dollars’ worth of U.S. equipment. He added that his platoon hadn’t been able to confirm that it had killed a single Taliban fighter. Read the entire article. There are a number of nuggets of gold in this one. First of all, it’s time that this unit get out of Fortress Margha and go on patrol. It’s being done in the Korangal valley, and it can be done in Bermel. Second, take note again at Philip’s salient observation: the campaign is “shorthanded.” It has always been, and as long as there is reluctance in the Obama administration to send more than 68,000 troops, it will always be shorthanded. It’s worse than whack-a-mole” counterinsurgency in Iraq. We have ceded control of the rural terrain to the insurgents, and melting back into the population is why day and night time patrols must be conducted and the population engaged. There are many more observations we may draw from this report, but take note of the recent Taliban tactic of using space blankets to avoid thermal imaging technology. This is a learning and adaptive insurgency, and the employing of technology as a replacement for boots on the ground simply won’t do. Complicating the Obama administration’s plan to ramp up civilian aid to Pakistan and Afghanistan, the State Department employs just 18 foreign service officers who can speak the language of the region where the Taliban insurgency rages, according to records and interviews. Two of them work in Afghanistan, both in the capital, Kabul, according to the State Department’s Bureau of Human Resources. Five are in Peshawar, Pakistan. The Pashto language is the main tongue of the mountainous Pashtun region that straddles the border between Pakistan and Afghanistan, where the Taliban and al-Qaeda recruit and operate. Afghan President Hamid Karzai is among the estimated 35 million Pashtuns in both countries. The State Department has long failed to meet its language needs. In 2006, the Government Accountability Office found that nearly 30% of State Department employees based overseas in “language-designated positions” could not speak and write the local language well enough to meet basic requirements. The language deficit is one reason the United States has turned to contractors to deliver foreign aid, a practice that Secretary of State Hillary Rodham Clinton says she wants to curb. Clinton is asking for billions in the coming budget to hire 1,226 additional diplomats, but it will take time to train them. After the 9/11 terrorist attacks, the U.S. military and the State Department boosted their training in Afghan languages, but the military commands vastly more resources. Seven years into the Afghanistan war, the Defense Department says it has trained 200 people in Pashto and 300 in Dari, the primary language of the non-Pashtun areas of Afghanistan. The California-based Defense Language Institute has given 10,000 people some basic exposure to Pashto through mobile training units, spokesman Brian Lamar said. The Defense Department gave a half-million-dollar grant to Indiana University to train ROTC candidates in Pashto. The State Department’s efforts have been more modest. In addition to the 18 foreign service officers who are proficient in Pashto, 82 speak Dari, State’s Bureau of Human Resources said in an e-mail. It said 20 Dari speakers are in Afghanistan. Those figures will improve, said Ruth Whiteside, who directs State’s Foreign Service Institute, which is training 13 diplomats in Pashto and 37 in Dari. A larger 2010 budget will expand those numbers, she said. Rather than reflexively blame the situation on the lack of money, let’s frame the problem somewhat differently. The Department of Defense knew that the exposure to and need for knowledge in the indigenous languages would be significant in counterinsurgency, so directed the funds and energy towards that end. The State Department is filled with “lifers,” many of them, who want to conduct international relations while sitting in Washington. North Korea has not been prevented from achieving nuclear status by State Department labors, and neither has Iran been persuaded to relinquish its pursuit of its own nuclear weapon. Syria was never forced to stop assisting the influx of foreign fighters into Iraq, and Hamas still controls Gaza. There should be mandatory language training at least one day per week at State (whether by tape or trainer). After all. What else do they have to do? Then after the languages are mastered, there ought to be mandatory field rotations for all State employees (that is, deployments). After all, what else do they have to do? There have been recent reports of fierce clashes between Pakistan Army and Taliban fighters There are even glowing reports that much of the North West Frontier Province has been cleared of Taliban. Eighty percent areas of Bajaur, Lower Dir and Buner have been cleared of the Taliban and displaced population has started returning to their native areas, Benazir Income Support Programme Chairwoman Farzana Raja said on Wednesday. Those who were returning to their homes were being facilitated and the situation would improve in the days to come, Farzana told a private television channel. She said accommodating 2.5 million internally displaced persons (IDPs) was a difficult task but efforts were underway to provide all basic necessities to the IDPs living in the relief camps. Farzana said rehabilitation would be the next phase and the government would undertake it in a befittingly manner. She said international assistance had also started to pour in and hoped the matter would be dealt with effectively. But is this report accurate? Other sources say not. Mehmood had to climb to a hilltop to get a signal for his cell phone. He sounded angry at both the Taliban and the army, but was especially critical of the security forces. Thousands of people are still trapped here due to the fighting between the Taliban and the army. They are in a state of virtual confinement due to the curfew. The government spokesmen, sitting in Islamabad or Peshawar, are making false claims about the situation in Swat, saying they have taken control of the situation, or captured that place, or killed so many Taliban. I swear upon God that it’s nothing like that. Except for some parts of the GT (Grand Trunk) road, some mountain tops and the circuit house in Mingora, all of Swat is under the control of the Taliban. If the government really has cleared and taken control of the region, it should bring in the media and let the whole world see it for themselves. I keep moving around, and in several places I have seen army checkpoints with a Taliban checkpoint nearby. However, neither side engages the other, and even helicopters and jets are not called in to attack the Taliban positions. A few days ago I tried to speak to a masked Taliban militant in Pashto, and then in Urdu, and he could not understand me. Then another militant told me that his comrade was an Arab and did not speak Pashto or Urdu. I then asked him ‘how are you’ in Arabic, and they all laughed. This raises doubts over the government’s claims that they have blocked all routes into the valley. How could he get in, when all roads are blocked? I also don’t understand who the operation is aimed against. A majority of the people who have been killed here are civilians. In order to understand this, we must remember that the Pakistan Army is not skilled in counterinsurgency strategy or tactics. But as we discussed eight months ago, and as reported by Dexter Filkins, there is something deeper. As an example, he cited the Pakistan Army’s first invasion of the tribal areas — of South Waziristan in 2004. Called Operation Shakai, the offensive was ostensibly aimed at ridding the area of Taliban militants. From an American perspective, the operation was a total failure. The army invaded, fought and then made a deal with one of the militant commanders, Nek Mohammed. The agreement was capped by a dramatic meeting between Mohammed and Safdar Hussein, one of the most senior officers in the Pakistan Army. “Mujahid” is the Arabic word for “holy warrior.” The ceremony, in fact, was captured on videotape, and the tape has been widely distributed. “The army agreed to compensate the locals for collateral damage,” the official said. “Where do you think that money went? It went to the Taliban. Who do you think paid the bill? The Americans. This is the way the game works. The Taliban is attacked, but it is never destroyed. Have the rules of the game changed enough for the Pakistan Army to clear the North West Frontier Province of Taliban for good, and stay and perform peace-keeping and stability operations? Time will tell, but we’ve heard this song before. If history is any indication, at some point the Pakistan Army will retreat and call it victory, while the Taliban who have slipped away into the hills return to enforce Sharia law and collect “taxes” to fund their military campaign. The Future Combat System Vehicle is soon to bite the dust. Army Secretary Pete Geren also clarified one point that is sure to raise the hackles of Sen. James Inhofe — the Non Line of Sight Cannon was killed as well. Inhofe had the NLOC made a separate program in large part to protect it from any cuts made to FCS. But Defense Secretary Robert Gates made the decision that killing MGV also meant killing the NLOS-C, Geren said today. An Acquisition Decision Memorandum should be out this week, splitting the Manned ground Vehicle from the rest of the FCS program and killing MGV, Casey told the subcommittee. He said they have already instructed Training and Doctrine Command to being drawing up new requirements. A new program outline for a new ground vehicle should be ready “after Labor Day,” Casey said. The military will consider foreign vehicles, though Casey seemed reluctant to commit to the idea of buying one should it look tempting. (While the Army has bought excellent equipment from overseas in the past, it has been badly burned before over buying from foreign suppliers — remember those black berets made in China…. ) The first vehicles should roll out of the plant within five to seven years. Sec. Gates and his budget experts have made very clear they expect MRAP will be a major part of the new approach to FCS. Casey and Geren were very cautious in responding to reporters questions about this after the hearing. “We are working to incorporate the MRAP” into whatever approach the Army comes up with, Geren said. And Casey said the Army is already putting networked MRAPs — with other FCS spinouts — into testing at Fort Bliss. And is being replaced with something that the Pentagon believes to be more conducive to fighting insurgencies and other asymmetric conflicts. Concerning the first article on the FCS Vehicle, commenter NeoConVet gets it right. As was the case with the Chinese made black berets…the emerging issue is our declining defense manufacturing capacity. At the outset of the current “over-seas contingent operation” (we used to call them wars) we did not even have the capability to manufacture enough 5.56 ball ammo! Most units crossed the l/d without the basic load! This is not so much a ‘buy America” issue as one of being self sustaining. Except that the problem actually runs deeper than that. First as the commenter mentions, there is the need to be self sufficient. The Captain’s Journal has mentioned the problems in the past with the loss of shipbuilding engineering experience, and it is no surprise that the USS San Antonio had so many problems straight out of port (see also here). But remember that defense dollars also means development of both infrastructure and technology. When money goes to contractors other than American, U.S. dollars are helping both to transfer U.S. technology overseas, and also to develop new technology in countries other than America. Finally, it gets even worse when those assisted with U.S. defense dollars are criminals like Vladimir Putin, who now owns a signficant portion of EADS and who stands to profit from the Airbus refueling tanker if the contract is awarded to EADS. This is the worst of all possible worlds. In this case, the U.S. would lose the capability to manufacture this aircraft, technology would be transferred overseas, and communist criminals would become wealthy off of U.S. defense dollars. But we just don’t want to learn our lessons. Sarbanes-Oxley is bad law, contractors know how to game the system, and the low bid almost always means getting the worst equipment.